The device works by applying pressure to the wearer based on the distance from the device to the nearest object, allowing them to perceive along the vector of the sensor. This paints a simple picture of surroundings, according to McEvoy, sufficient to “find every doorway [in my apartment] with my eyes closed,” even when handheld. When we interviewed McEvoy, he had a lot to say on the topic as well as describing in detail the sensation of wearing it. “We commit a lot of our brain power to processing stereo images in order to gauge distance. Sighted people take this for granted… Imagine hallways in a shopping mall. Often they have perfectly smooth floors or maybe tiles. The mall from my hometown has tiles which are diagonal to the direction people walk. If they had been installed parallel to the walls a blind person could easily walk a straight line but we don’t even think about what the world would be like without sight..” This piece of wearable tech was designed to make these tasks easier – and to give blind and vision-impaired people more choices in how to interact with the world. “One of my early prototypes was sent to North Carolina where a woman wanted to make one for her legally-blind friend who refused to carry a cane,” said McEvoy. “ That’s exactly who I want to help with this project: people who don’t want to carry a cane.” When asked about his personal take on the project, he answered, “the most interesting part of this device is the price. It was designed to be built by anyone with a computer, some soldering skills, and $10,“ he said. The modularity of this device is very exciting as well. A caver could mount it in their helmet (my first thought, honestly), a cyclist on their handlebars – all using the provided Instructable. With some time to adapt to the device you can learn what common distances mean, acquire a visceral and tactile comprehension of the world – turn depth perception into something you feel in your gut, in your brow, in your palm. The potential for this technology is enormous, and it’s evolving now. Sensory substitution, using one sense to do the work of another, is a field of continuous innovation. Ranging from noted biohacker Rich Lee’s work on implantable headphones to the wide ranging of haptic devices including vests that sense the stock market and electrotactile systems that sit on the tongue and zap your surroundings into focus, this field is moving rapidly. For bodyhackers this represents a challenge to engage with their own senses – does your work or recreation call for the precision of sight in the realm of sound? Have you ever wished you had a second sight in the dark or eyes on the back of your head? Do you want to feel your surroundings, not in a metaphor but the reality through your skin? McEvoy’s design of course is an excellent starting point. Anyone can see the next steps – arrays of modular mounts for a broader spectrum of perception, variations in intensity, longer range materials for more specialized applications or stabilized mounts for consistent performance. This is an easy entry point to a field that has outstanding potential, and devices based on these principles are approved for assistance to the blind in the E.U. and seeking to begin trials in the U.S. The only question now is- how long until you try it? The Instructable for this project is available here. Technical readers may be interested as well in a later iteration of the project, the vibrating distance sensor. 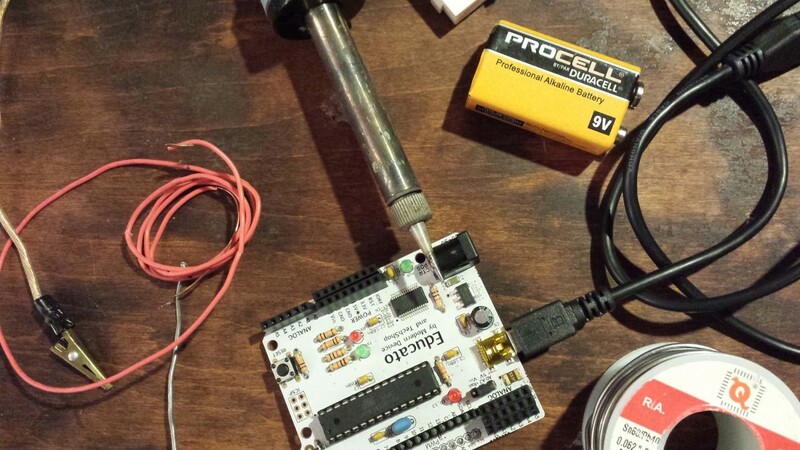 Mr. McEvoy’s website features many more interesting projects in a readable and interesting format, as well as a number of Arduino hacks and premade scripts. If you have tried this or related bodyhacks, tell us about it in the comments.